I still remember reading the movie listings in my local paper in 1987 and howling with laughter on seeing that my hometown theater was showing the Jack Nicholson/Susan Sarandon film Richard of Eastwick. So I felt quite nostalgic when I saw the offerings at the Fresh Pond Cinema the other week. Copyeditor General's ruling: I'm not too sure about Ghoast Town, but frankly Knights in Rodanthe would have made for a much more interesting narrative. 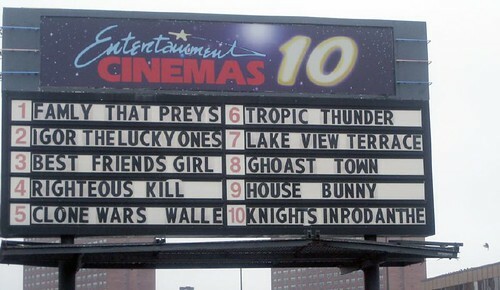 Oh, also, the listings on the other side of the board had Righteous spelled wronglyous.